Description: Custom brick house with stone accents on dormers and front porch. Large corner lot with little traffic. Built in 2007. Dual 50-gallon water heaters. Street side of roof has been replaced 2 years ago. Hardwood, carpet and ceramic tile throughout. All stainless kitchen appliances stay. Ku underground electric with city water/sewer. 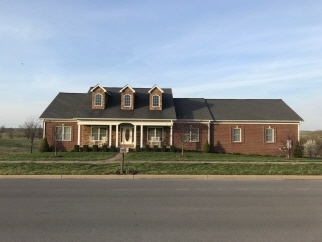 1st floor master with master bath suite- whirlpool tub, custom tile shower. 2 additional bedrooms and full baths on the 1st floor. Kitchen with separate formal dining room, living room with vaulted ceilings and gas fireplace with mantel, study could be converted to a 4th bedroom on the 1st floor. Covered deck with upgraded vinyl railing, pea gravel stone flooring, pre-wired for 220 hot tub. Fantastic view of large farm with stacked rock fences. Large 3+ car garage with 12' tall insulated doors. Data believed correct but not guaranteed. Buyer to verify data prior to offer. Agents read agent remarks.